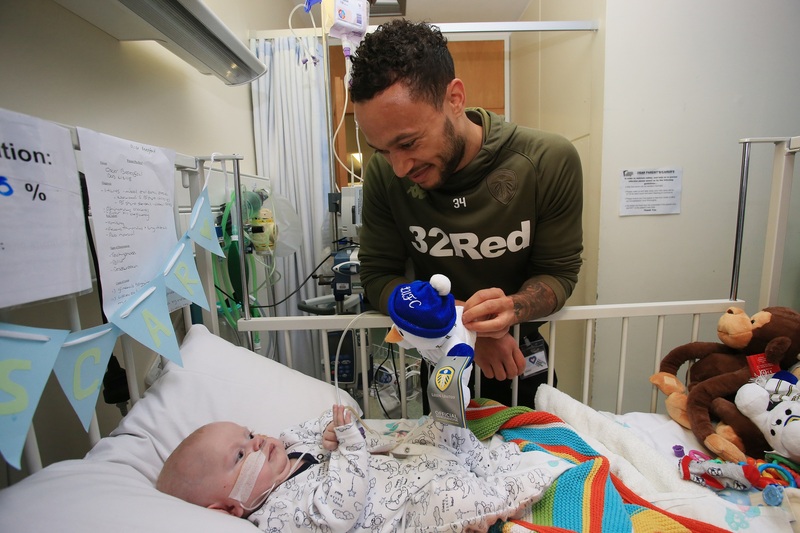 Lewis Baker pays visit to Leeds General Infirmary. Lewis Baker paid a visit to the Congenital Heart Unit at Leeds General Infirmary recently to help them decorate their ward for Christmas. The Leeds United star joined staff from the club’s charity of the year, Children’s Heart Surgery Fund, by taking some Leeds United decorations for their Christmas tree and some festive teddies for the patients currently receiving treatment on the ward. Currently on loan from Premier League side Chelsea, Baker spent time decorating the Christmas tree with young patient Kian and visiting all of the young heart patients and their families who are currently having to spend time on the ward in the run-up to Christmas. The midfielder spoke to LUTV during the visit and said: “It’s really nice to come and see the kids and help put a smile on their faces. Seeing first-hand what some of these kids are going through, it’s a lot – and it’s a lot for their parents as well, so if we can do small gestures like this to bring smiles then that’s great. Ellie Brown, Fundraising Manager for Children’s Heart Surgery Fund, added: “It was a pleasure to welcome Lewis onto the children’s heart ward. He was so kind to the families he met and brought a smile to many children’s faces. The Christmas tree he decorated has pride of place on the ward now. The local charity work to support children and adults born with congenital heart disease across all of Yorkshire and they work closely with the Leeds Congenital Heart Unit at Leeds General Infirmary. The partnership with CHSF will hopefully raise vital funds throughout the 2018/19 season to help save the lives of some of these young heart heroes, support their families through the most difficult times and celebrate their recoveries and bravery. The funds raised will specifically provide life-saving equipment including Super Life-Support machines and a new dialysis machine for the Paediatric Intensive Care Unit at Leeds General Infirmary. Whilst other money raised will go towards helping to refurbish the CHSF family unit provision at the local hospital – this currently consists of seven bedrooms, a kitchen and lounge area. If you would like to donate to the campaign you can either visit justgiving.com/all-leeds-all-heart or you can text LUFC19 followed by the amount you’d like to donate to 70070.